The First part is about the fundamentals…getting your kids to take their first financial steps. Three jam jars…to put their pocket money in. Three jobs…so they can earn that pocket money. Three minutes a week…where you’ll ‘lock in’ life-changing money lessons with a simple weekly ritual over dinner. The second part of the book will arm your kids with the life-changing money skills that most people don’t learn till they’re in their 40s (if ever!). By the time you get to this part, you’ll have already scored the big wins that ensure your kids never have to worry about money. Believe it or not, paying pocket money is one of the most powerful tools you have to teach your kids about money. Getting them to do a few chores and paying them a few bucks is only the first step. The main money lesson comes in what they do with their pocket money: the spending… the saving… and the giving. That’s where the life-changing lessons really happen. You want to take that pocket money and use it to teach your kids things like goal-setting, delayed gratification, kindness and empathy. Three jars. Three jobs. Done and dusted in three minutes a week. The truth is that sometimes pocket money works a little too well: kids can get so addicted to watching the coins pile up in their jars that they don’t want to spend it. You don’t want your kids to grow up with an unhealthy obsession with money. This jar will help turn your kids into well-adjusted, savvy spenders. The Smile Jar is for saving up for things that will make your kids smile. The golden rule of wealth is to spend less than you earn. Lack of self-control in childhood was the number one predictor of financial problems-more so than social class or even IQ! Here’s the deal: the art of saving is as much a financial technique as it is a character trait. When you ingrain the act of regular, systematic saving, you’re not only creating money ‘muscle memory’- you’re giving your kid a way of looking at the world that will keep them safe, long after you’re gone. Not only do studies repeatedly show that we get more pleasure from spending money on other people than on ourselves, it has even been shown to change the mindset of bratty, self-centred teenagers. Kids have three jobs to do each week-and they only get paid if they do them. It’s up to you what jobs you want your kids to do, and the payment for each. Clean your room on a Sunday so you can start the week afresh. Put the bins out each week, and bring them back in. Do basic yard work, sweeping, and feeding pets. Tailor these jobs to your kids, your family and your situation. Lock in the link between working, earning, giving, saving and splurging in your kids minds…in just three minutes a week. Second minute: Pay them. Count out the coins like a croupier, straight into their hand. Third minute: Watch the divvy it up into the three jars. (The only rule? Every jar must get something. In just three minutes you’ve reinforced the link between ‘working’ and ‘earning’ in your kid’s mind. Stick it on the fridge and tell your kids: to get paid, your jobs must be done-and crossed off on the Scoreboard. A good rule of toe is to pay $1 per week, per year of age. So a seven-year-old would get $7 a week. It’s simply a visual aid for teaching values. And they get a pay rise each birthday! Number one habit for raising successful kids: Regular family dinners. A comprehensive 16-year long study by Michigan State University found that the simple act of having regular family dinners was the single biggest predictor of academic achievement. More than that, the study found that a shared family mealtime was more influential than studying, attending religious services or playing sports. Remember the motto of this book. It opens your kids to the benefits of sitting down to a regular meal together, better academic performance, higher self-confidence and improved resilience. It follows the time-tested principles of the Japanese honourable mealtime to instil a lifelong work ethic in your kids. It serves as the ‘anchor’ for your new ‘three jam jars, three jobs, three minutes’ pocket money system – to supply the missing link between hard work, earning and giving/savings/spending. To build the habit, choose the same night each week like a Sunday night. Set up an online saver account where you can store their birthday money from grandparents and the like-and perhaps bank some pocket money savings when they fill their jars. Open another online saver that’s linked to your existing bank account. ING Orange Everyday account, with a linked Savings Maximiser account. Divide our income into three buckets. A Blow Bucket, for daily expenses, the occasional splurge and some extra cash to fight financial fires. 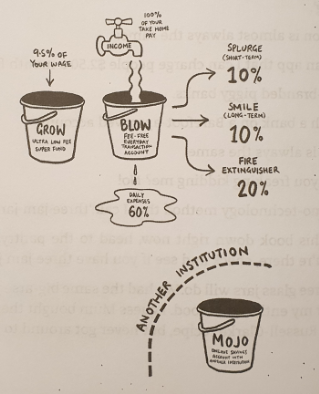 A Grow Bucket, to build long-term wealth and total security (e.g. investments and super). This is another high-interest online savings account, linked to their everyday Splurge account. This is a high-interest online savings account preferably opened with another bank, so they don’t see it in their regular day-to-day banking app. A Mojo account is your financial ‘get out of jail free’ card – when you have savings set aside, you’re never be financially vulnerable. You call the shots. Right now, the best account for your teens is the ING Orange Everyday Youth account. You have to be at least 15 years old to apply. In this chapter we’re going to tackle one of the biggest parental pain points: pester power! The definition of pester power (according to Wikipedia) is ‘the tendency of children, who are bombarded with marketers’ messages, to unrelentingly request advertised items’. Another way to break the conditioning is to play a game I call ‘Flogglebox’. Think of it like Gogglebox (the TV show about people watching TV shows), but for ads. It works like this: you watch TV with your kids but turn the sound down when the ads come on. As they’re watching an ad in silence, ask them three questions. What is this ad flogging? What are the tricks the ad’s using to flog it? Do you really need it, or is it just something you might want? Encourage your kids to choose an item they no longer use. Step 3: They get to buy something second-hand! Before your child leaves home, they should have volunteered in their local community. Happiness doesn’t come from stuff – it comes from helping other people. The easiest way to introduce little kids to the power of helping people is to go to your pantry and see what you can give away (or grow your own veggies, and donate them. Simply google your local Foodbank. Encourage your kids to bring along some money from their Give Jar so they can buy food with their own money, and then on the way home you can drop it off. The science shows that the simple habit of maintaining a give jar – used to fund a deliberate act of kindness has a powerful, lasting, and brat-breaking effect. Kindness is addictive – and it can grow into a lifelong habit, that’ll keep your kids centred and happy. For your teen to save you at least $100 on your household bills by negotiating a better deal. When it comes to electricity research, direct your teen to the Government website energymadeeasy.gov.au. The aim of credit card providers is to turn your money into theirs. Credit is borrowing money to buy things. And the interest you pay makes everything you buy more expensive. The biggest purchase you make on your credit card is…interest. Make no dog bones about it, the game is designed that way. Credit cards are compound interest, but in reverse. They’re designed to blow out and grow bigger and bigger, even if you stop spending. In our family we EARN interest, not pay it. Any kid who finished high school without having done at least some form of paid employment (even if it’s over the summer holidays) hasn’t had a well-rounded education. The first step is for you, the parent. It’s called ‘the taxi rank’ because you are the taxi, and you get to rank (shortlist) the workplaces you’re prepared to drive your teen to and from. Five questions every employer will ask you? Are you going to work hard? What the interviewer really wants to see is that your kid is a decent person who’ll fit in with the team. And they want to work this out as quickly as possible so they can get back to their real work. The average workplace is really just another version of their high school classroom: there are people slacking off, gossiping, shirking responsibility, bitching about the boss (the teacher), and blaming everyone (except themselves). The truth is that how you do any job is how you do every job. Say please and thank you, and smile while you do it. You should be investing every last dollar of your super – 100 per cent – into the greatest wealth-building machine ever created: the share market. Call your HR department and find out if you are allowed to choose your own super fund. If you can’t switch super funds, pull out your phone and call your super fund and ask to be invested in their ‘high growth’ investment option. 100 per cent in shares, no 25 per cent ‘safety net’ like Warren. Why would you bother switching super funds? The finance industry skims off $31 billion each year from our super funds. Which means that many boats, mansions, planes and overseas junkets have been financed by compulsory superannuation. From your super. These financial leeches are happy to get their hands on your money, because they know the average kid doesn’t give a guacamole about super fees. And over decades that will rob you of hundreds of thousands of dollars. It’s pretty simple really: the more fees the fund managers takes, the less you make. Invest your money 100 per cent in shares. Invest in ‘index funds’ that automatically buys all the companies that make up a share market index, and track the market. I recommend spilt it half and half between Aussie shares and international shares: Fifty per cent in 200 of the largest businesses in Australia – like the banks, BHP, Sydney Airport, Telstra, Woolies and CSL. Fifty per cent in 1582 of the world’s largest businesses – like Apple, Facebook, Amazon, Nike and Nestle. Teach your kids about the power of having a strong work ethic, of building something you’re passionate about over a lifetime, and of letting that be its own reward. How should I invest it? If you’re investing for longer than 10 years, you should be invested in the share market. However, if your timeframe is shorter than that, sign up to an online savings account and set up a regular monthly savings plan. The biggest predictor of your kids’ happiness and success in life is how much time you spend with them, not the school they go to. Yet the irony is, parents often work extra jobs just to pay the fees.